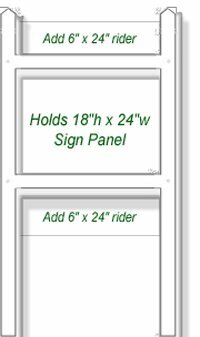 E-Z sign frame are 62" tall and made of 1-1/2" engineer grade extruded vinyl. These real estate posts take the place of the bulky 4" x 4" wooden posts. The compact post conveniently slips together and installs in just minutes. All sign attaching hardware is included. The estate sign Frame is constructed of durable vinyl materials and will hold up under all weather and soil conditions. Made to last for years of outside use.